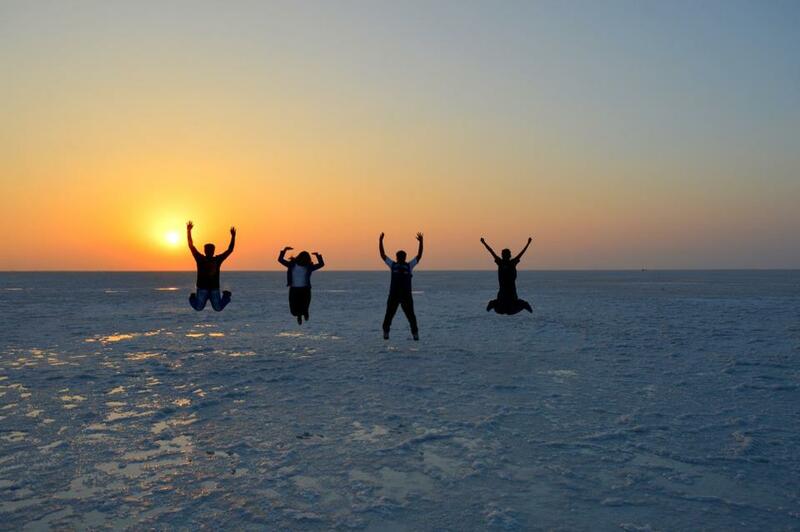 The Kutch Region of Gujarat offers some of the best and most exciting trails for a road trip in India. What better way to explore its vistas than on a motorbike with the wind and dust on my face and being a 'part' of the landscape rather than passively observe it cooped up inside a car! The present day District of Kutch in Gujarat was known as Cutch State during the Colonial era and was a largish princely state with its Jadeja Ruler entitled to a 17 Gun Salute (highest was 21 guns for the Nizam of Hyderabad and the Maharaja of Jammu &Kashmir). The state was merged with the Union of India and the state of Gujarat in 1956. Since then, it has been the largest district of India in terms of area with a total expense of 45,652 SQ km i.e. exactly 1 ½ times the size of Belgium. Long wide roads in most part with a plethora of heritage locales varying from Harappan sites, religious places, monuments and the unique Rann of Kutch make Kutch a biker's paradise. 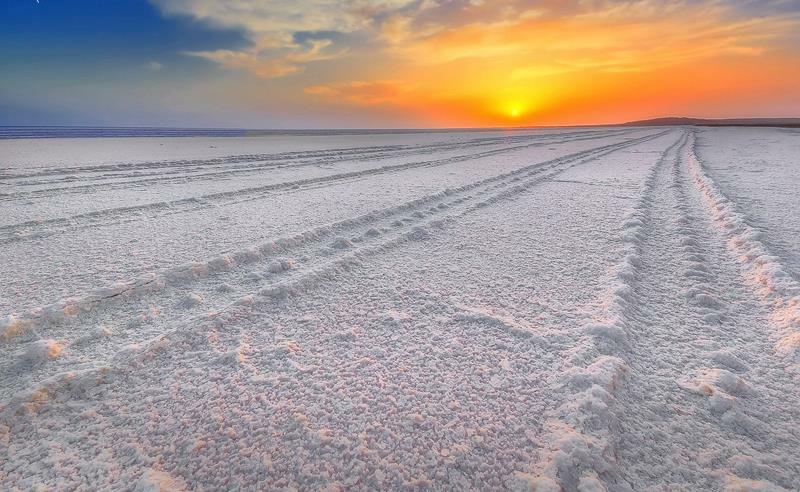 In fact, the Ahmedabad-White Rann of Kutch the route has consistently featured in the top five motorcycling routes in India by all the major biker forums. 2016 being my fourth year in Great Rann of Kutch- I have already biked and motored most parts of this exotic land. But I always had this burning desire to go a little off the usual biker trails of Dhordo, Mandvi, Lakhpat etc which I have already done. With Samyukta, my daughter in town on her first vacation from College, I thought that the time and company were now right to hit the road if not for anything else, but for a short one day trip to explore the parts of the Rann which I was yet to visit. I also firmly believe that a nice long bike trip is definitely a rejuvenating tonic for the soul. 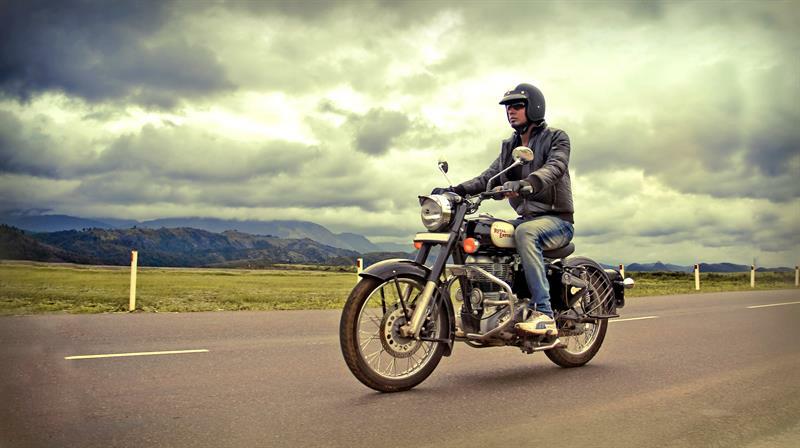 Our journey started from Welspun City Anjar on my trusty old' Royal Enfield Bullet. Once we cleared the squalor of Anjar town we hit the Bhuj Highway (NH 341) which is a pleasure to ride on. Crossing Bhuj we hit the Road to north towards the White Rann (a continuation of the same highway) passing by the Bhuj Airforce Base. After a short break at the Rudramata Dam Bridge, about 65 km from our starting point we headed straight towards the Rann. About 40 km further and after a drive, through some really stark landscape, we reached Bhirandiyara post, where the left turn takes you to Dhordo and the tent city whereas the highway leads straight to Khavda and beyond to India Bridge. Khavda is the last civilian inhabited village on the Indian side and is about 90 km from the International Border. This is the last place you can buy bottled water, eatables, find a mechanic and of course fuel for your machine. About 20 km from Khavda is the famous India Bridge the last place till which 'civilians' are permitted and beyond which a permit is required from BSF. Also, no photography is permitted beyond this as it is a sensitive border zone. As I had already taken the requisite permissions from the BSF, all it took me was an entry in the register and we moved on towards the border- our initial destination being Dharamshala Chowk, about 12 km down the road. The beautiful sandstone war memorial at Dharamshala is truly worth a visit (though it looks somewhat incomplete). The quietness and desolation of the place too added to its aura. After a cup of tea and a glass of water provided by our BSF friends at the post at Dharamshala we set course to our next destination- Bedia Bet the BSF out Post very close to the border fence which was 27 km away. Bedia Bet is also famous for a small Hanuman Temple which is revered quite a bit in these parts. However, I was warned that after a few kilometers, the road condition was not good. Indeed after crossing Chidiya More or Eagle Chowk (where we had to make another register entry) the road which was reasonably good so far, deteriorated to a small one-way road which was rutted and broken at a number of places. I realized that the road had been created by filling up the soil through the Rann and in fact, is not even shown on the map. It is here that we could actually see the stark beauty of the Rann of Kutch with only a few military trucks and dumpers and the famed wild asses for a company. 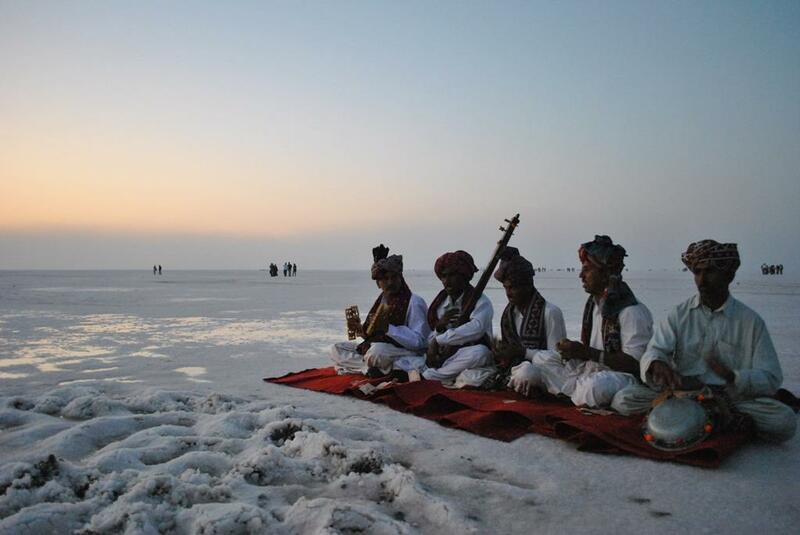 The Rann of Kutch is a unique land mass. It features in the world list of "Most Alien-Looking Places on Earth". Unending salt flats broke only by bets –islands or raised grounds with some shrubs growing on them and greenish pools of cupric brine. The landscape we encountered on our way to Bedia Bet was stark, surreal and on the whole overwhelming, the bad road and our sore posteriors notwithstanding! After a lot of bump and grind, we reached Bedia Bet – a tiny Bet which has a BOP and a small BSF camp. The genial post commander showed us the Hanuman Temple which is actually quite small and numerous bells of all shapes and sizes adorn its compound. Apparently, devotees hang bells there after their prayers and wishes are fulfilled. Local legend says that during the 1965 war, the Indian soldiers established the idol in Dhara Bani in Pakistan (which had been occupied by India) but brought it back to India after the war as the location was reverted to Pakistan after the 1966 Tashkent Agreement. The idol was to be installed in Khavda but during an overnight stay at Bedia bet, the idol stuck itself firmly to the ground and couldn't be budged. The temple was built soon after. Such legends persist in all inhospitable border areas be it the remote mountains of the North East or the barren desert lands of Rajasthan and Gujarat. I had the good fortune to visit many such places during my military career- but those will make different stories. Being a keen reader of military history and my father actually participating in the 1965 war in the very same area, this trip was also more of a heritage trip for me and my daughter to see the very places where may heroic battles had been fought by the Indian Army, especially in 1965. The trip was, therefore, all the more gratifying. The International Border is just 3 km from Bedia Bet. A short bumpy ride took us there and we could now see the formidable border fence and Pakistan beyond it firsthand. The boundary pillar lies somewhat ahead of the fence since as per the Geneva Conventions there is supposed to be no construction on either side within 150 yards (the normal range of small arms). The ride back to Chidiya More and subsequently to the Dharamshala checkpoint was a lovely one. However, ahead of Dharamshala, we had our first (and only) hiccup as my trusty steed suddenly stopped. A quick check by me revealed that there had been an electrical failure and unlike smaller bikes, there was no way one could start the large engine of a Royal Enfield without power emanating from the battery. The battery had also spewed acid out which I realized once my fingers started burning. After such an excellent trip so far…Lo, behold! We were now stuck in the middle of nowhere (hardly any civilian traffic on the road as we were still ahead of India Bridge). It was getting mighty warm too as it was 1:00 PM in the afternoon. The mobile network too was exceedingly poor, but after a lot of tries, I managed to get through to the BSF at Dharamshala who were kind enough to immediately dispatch a Gypsy with an electrician. They reached me in about ½ hours time. A thorough check by them too revealed that though the battery seemed fine, there was no power on the bike. Finally, the fault was located to a busted fuse which was replaced with a spare one available for the bike. After thanking the soldiers for their prompt help we were again on our way. Our next halt was the Border Out Post (BOP) at Dhordo, near the tent city. We took the brand new road connecting Khavda to tent city and saved some distance as we would otherwise have had to go to Bhirandiyara and then do to Dhordo. The new road, though narrow is very good and literally cuts across the White Rann. I have heard that there is an extension now planned to connect Khavda directly to Dholavira, the Harappan site which presently is not reachable from this direction and can only be approached tom the East from Rapar (waiting for that to happen so that I could plan my next trip to Dholavira through the exciting new route which will cut through yet uncharted areas of the Rann!). We are at Dhordo BOP in about 40 minutes time as the road was open and the Bullet was able to cruise at a good speed without too many gear changes. The Dhordo BSF company commander (who was also very knowledgeable about the history and geography of the area) kindly offered us lunch which we most graciously accepted (as it was 3:00 PM by now and both of us were quite famished after the bump and grind since morning). After wolfing down a simple yet tasty lunch we set course for a round of the tent city. I have been visiting the tent city every year during the Rann of Kutch Utsav since 2013, but it never ceases to surprise. This year, the surprise was that the Tent City was full of Harleys (Harley Davidson motorbikes for those not very familiar with bike parlance!) of all shapes and sizes. It emerged that the entire city had been booked by the famous Harley Club, HOG (Harley Owners Group) for the day. This also explained the few packs of Harley riders heading towards Dhordo while we were coming in from Anjar in the morning). The Western India Annual HOG Camp had been planned in Tent City on that particular day. Samyukta especially had a field day photographing herself with some fabulously beautiful Harley Davidsons! It was 4:30 PM now and unfortunately it was time for us to head back home after this quickfire trip to the Rann. The ride back was long and the only break we took was at Budhia's Shop near Bhujodi Railway Crossing. The shop is unique in the sense that he sells a lot of organic products including exotic juices like raw dates, watermelon, grape, musk melon and also a wide range of pickles (you must try the shop at least once if you are passing by that way). After a quick bite of deli and some yummy raw dates juice, we hit the road again. We got back home by 7:00 PM with tired limbs and sore posteriors, having burnt rubber for about 412 km since morning! But surely the batteries of our mind and soul were fully charged. The trip would definitely not have been so enjoyable but for the BSF friends we met all along our journey. Meanwhile, my daughter is already in the process of planning the next trip albeit a little longer and a little less rushed so that we could absorb all the Zen of our surroundings in an even more profound manner.